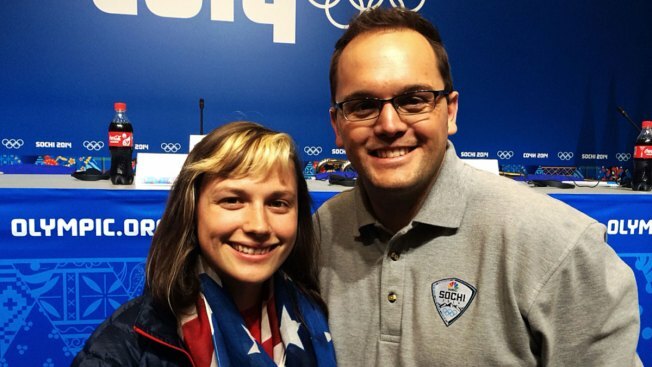 Pat's Sochi Blog: "Go Get a Medal Sugar"
Speed skater Sugar Todd has had this Tuesday, Feb. 11 in her mind since she was a little girl. Literally. When Todd was 8, she came up with a crazy scheme only an 8-year-old would be creative/ridiculous enough to imagine. In the name of her Olympic dream, her dad, Mike, would stay in their home in Omaha, Neb., and continue to farm, while Sugar and her mom, Diane, would live in Milwaukee, Wis., so she could receive better speed skating training. All Mike would have to do was commute the 1,000 miles back and forth every two weeks. See? The plan was both creative AND ridiculous. Only, her parents didn't think so. Amazingly, Mike and Diane bought in and agreed. "I didn't really appreciate it as much then as I do now," said the extremely genuine Todd. "They're, they're kind of crazy!" Now residents about an hour east of Dallas in Breshear, Texas, the Todds' 1990s craziness looks an awful lot like 2014 brilliance today. Tuesday, Sugar will make her Olympics debut in the Women's 500m in Adler Arena. And the best part? Her parents will be there in-person to support her. Sugar went to the Team USA fans online, asking on her GoFundMe site to help raise the $5,000 needed for her folks to make the trip, and the fans came through. "My parents and I thank you all from our entire hearts, and they promise to have plenty of fun in Sochi. Seriously, THANK YOU! I am so pumped to know so many remarkable people and that they all know even more remarkable people. You guys are wild." When I spoke to her a few days ago, she described raising the money to get her parents to Sochi as, "the biggest thank you I can give them," and told me she "might start to cry" when she sees them in the crowd as she takes the ice. I plan to meet Mike and Diane later this week. And after the extremely lighthearted and enjoyable conversation I had with her, I'm not ashamed to be biased: Go get a medal, Sugar.